James "Ted" Sweeney in court in January. FARMINGTON - A Jay man convicted of murdering his ex-girlfriend with a softball bat was sentenced to 38 years in prison Wednesday in Franklin County Superior Court. James "Ted" Sweeney, 59 of Jay, was convicted of murder on Feb. 1, with Justice William Stokes finding that Sweeney had not lacked substantial capacity to appreciate the wrongfulness of his conduct when he struck Wendy Douglass in the head and face with a bat in the early morning hours of July 11, 2017. On Wednesday, friends and family of Douglass gathered in the courtroom as attorneys for the state and Sweeney augmented previously-submitted memorandums with sentencing arguments. As was the case throughout the four-and-a-half day trial that took place in January, American Sign Language interpreters were on hand to translate for Sweeney, who is deaf. Sweeney and Douglass had been in a roughly 10-year relationship that had ended at some point in mid- to late-July 2017, although Sweeney had been permitted to continue living at Douglass' residence at 5 Jewell Street in Jay. While things had generally been good over that 10-year period, the final year-plus of the relationship had been marked by jealousy and suspicion on the part of Sweeney toward Douglass. That jealousy - unfounded according to all witness testimony - had become so "obsessive and extreme," as Stokes put it in his verdict, that the defendant had apparently installed a game camera to spy on the home's comings and goings, wore disguises and borrowed vehicles to follow Douglass and would talk of little else to some family members. Sweeney told doctors for the state and defense that after returning from having a smoke outside, he saw Douglass' cellphone with a text message that said 'gone.' He "panicked" as a result of the message, retrieving the softball bat from the hallway at around 4:30 a.m. After pacing with the bat for roughly an hour, Sweeney told the doctors that he went into Douglass' bedroom, shouted "you lie to me" and struck her three times with the bat. From there, he returned the bat to the hallway, taped a note to Douglass' bedroom door, emailed the pastor of the church he and Douglass attended and texted his sons. He then went to Androscoggin County Jail, where he informed a corrections officer that someone needed to check on his girlfriend at 5 Jewell Street because he had hurt her. 'I did wrong' that note concluded. Jay police, conducting a welfare check triggered by Sweeney's note at the Androscoggin County Jail, discovered Douglass after they gained entry to her home later that morning. Assistant Attorney General Meg Elam, who represented the state along with AAG Leane Zainea during the trial, said that Sweeney had made a choice due to his jealousy of Douglass, who had recently ended her 10-year relationship Sweeney, when he picked up a wooden softball bat and struck the 51-year-old Jay woman in the head at least three times. 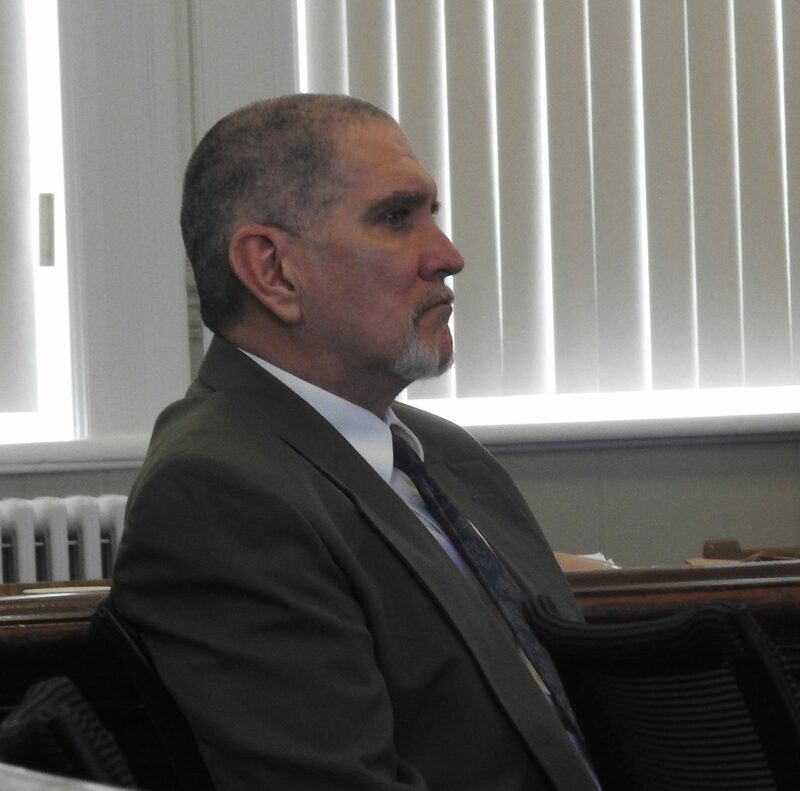 She pointed to a previous incident described at trial, in which Sweeney took a gun into Douglass' bedroom and, according to Douglass' mother, Cynthia Mulhern, threatened to kill her. That "horrible, hideous manipulation" was an element of the domestic violence that would eventually claim Douglass' life, Elam said. Two family members spoke in court, with a number of other people submitting written victim impact statements. Mulhern spoke to her daughter's generosity toward Sweeney, saying that it made his betrayal that much more horrific. She said she would forever feel that she should have done more to get Douglass away from Sweeney. "I will never be able to erase this from my mind," Mulhern said. "I will not have any peace." Jessica Douglass, Wendy's daughter, said that her sense of security and safety were gone. Wendy Douglass was killed on her birthday, Jessica said, ensuring that she would be reminded of the death every year. "My mother is going to miss out on the rest of my brother's and my life," Jessica Douglass said. The state asked for a sentence of 55 years, with Elam arguing that the victim impact and other aggravating factors, such as Sweeney's criminal history which included a misdemeanor assault, outweighed any mitigating factors. Walter Hanstein, who represented Sweeney along with attorney Thomas Carey during the trial, argued for a sentence of 25 years in prison. Hanstein said that the state had not proved the murder was intentional; instead, Stokes' verdict indicated that the judge had reasonable doubt it was Sweeney's "conscious object" to kill Douglass but that he had no similar doubt that the defendant knowingly caused the victim's death. That Sweeney had not been found guilty of intentional murder should be weighed in the defendant's favor at sentencing, Hanstein said. He also pointed to what he said were other mitigating factors, including Sweeney's background of sexual and physical abuse. Sweeney provided Stokes with a letter which Hanstein read in open court. In it, Sweeney said that he loved Wendy Douglass and her family, offering an apology for causing her death. "I pray you to understand my deep sorrow feel to my Wendy Douglass," Sweeney wrote. "I am not monster." Stokes called the murder a brutal, violent, unprovoked bludgeoning inflicted upon an innocent woman as she slept. He also said that he could not shake the belief that Sweeney had serious mental health issues that had arisen in the six to nine months prior to Douglass' death. It must have been "unbearable" for Douglass to live with Sweeney given his mounting, obsessive jealousy, Stokes said, noting that the case presented as a classic case of domestic violence in many respects. He said that he had no question that Douglass had loved Sweeney. "That's the saddest part, Mr. Sweeney," Stokes said. "The sad part--the irony, is that she did love you. And you killed her. That is the sad tragedy of domestic violence." Stokes' sentencing remarks focused mostly on Sweeney's mental health issues and the impact of the murder on Douglass' family. The impact on the victim's family was incalculable, Stokes said, telling Douglass' friends and family members that he was very sorry for the pain they went through. "You didn't just commit a knowing murder on July 11, 2017," Stokes told Sweeney. "You took people's memories, [their] future memories." Stokes said that he did believe that Sweeney was having some type of mental health crisis in the summer of 2017, one that may have been exacerbated by his deafness. "I think he's right, I don't think he's a monster," Stokes said, referring to Sweeney's letter. "I think he did something monstrous." Stokes sentenced Sweeney to 38 years in prison. He will also have to pay $1,785 in restitution to the Victims Compensation Board, which provides some support for the families of murder victims. I know 38 years is pretty much a life sentence but why not sentence him to live without parole? Also there would much less crimes like this and much less drug dealing if both carried a mandatory sentence of death. @Old Maineiac there is no proof that the death penalty is correlated with lower crime rates. In fact, there is evidence that supports the contrary. More guns in society do not make people safer. More war does not make the world safer. It is time to stop fighting violence with violence. I disagree Rob S.... If harsh sentences were mandated you would see crime rates drop!! As for the death penalty.... I believe in "An Eye For An Eye!!" We are taxed to pay for the "for profit prisons" where Sweeney and others like him are stored, for life or for some predetermined sentence. I would prefer to use my tax dollars to support mental health care for the individuals before they crack, before they kill. So many have no knowledge where health care of any kind is concerned. So many have fallen thru the cracks. If we are looking for someone to blame, specifically for drug addiction or mental health breakdowns, and their followup mayhem, lets start with politicians that cut mental health budgets and general access to affordable (???) health insurance, and at the executives and high level proponents of all the pills that start so many on their habits. If it becomes a penalizable crime to make access to healthcare unaffordable, and a crime to manufacture, advertise, distribute and advocate for all the Oxy-this and thats, other means of pain management will be brought into the public domain. Stupid and lazy will always find a way to get high, rather than deal with life. The recipient of life long pain from a drunken driver smash should not be lumped into the same bag as the stupid and lazy. And the ones in positions of political or financial power must answer for the decisions they make in both cases. Rob S, so let's pay to keep all violent criminals behind bars in an already overcrowded prison system. Let's not allow law abiding citizens to defend themselves and their families against criminals. In regards to war maybe we should drop tulips and daisies on rogue nations that would teach them, oh I got it let's draw a line in the sand and do nothing when it's crossed. Are all wars necessary? No, Will carrying a gun always protect you and your family? No. Will putting all violent criminals to death make us safer? No. But I'll take taking out terrorist countries who gas their own citizens. I'll keep my guns to improve my chances against criminals. And I favor putting violent criminals to death. Utopia unfortunately doesn't exist. @ Realistic, "so let's pay to keep all violent criminals behind bars in an already overcrowded prison system". What does that mean? Are you suggesting that we execute criminals because the prisons are "overcrowded". That effing ridiculous. I couldn't have stated it better myself. Thank you for your thoughtful comments. OutsideIn, I was replying to Rob S in regards to the DEATH PENALTY. Most people would have got that. You saying " That effing ridiculous " shows your intellect. @Lauri you had me until stupid and lazy. Unfortunately, claiming that addicts are stupid and lazy is an indication that you are among the majority in our society that does not understand mental health. I hope that Sweeney does get the mental health help that he needs. @Realistic: I think it's unfair to make assumptions about intellect based on typos. Just because your comment reads like an NRA fever dream doesn't mean I'm going to judge your intelligence. Omar, it's Friday go stand in front of the post office. @Omar, you might want to check to see what "effing" was used in place of before you make a comment. I wonder if those touting "eye for an eye" realize it comes from Hammurabi's code, a Babylonian king that predates the the Christian Old Testament. The Old Testament is the same thing as the Jewish Tanakh, same books, same history, same people. Moses laws date approx. 400 years after Hammurabi, and in many cases verbatim from Hammurabi's Code. We have ancient stone inscriptions from Babylon of Hammurabi's Code...which is present day Iraq. The code also does not provide equal eye for an eye for all people...because not all people were considered equal: Hammurabi's Code Line #196: "If a man destroy the eye of another man, they shall destroy his eye. If one break a man's bone, they shall break his bone. If one destroy the eye of a freeman or break the bone of a freeman he shall pay one gold mina. If one destroy the eye of a man's slave or break a bone of a man's slave he shall pay one-half his price." I mention this to draw out why "eye for an eye" becomes murky and not as straight forward as it may seem. Think for example, what if one of your children destroys your other child's eye intentionally in a temper tantrum? Or, one of their school friends eye? Is a child a free individual? Do you deem a child's mind developed and capable enough to understand consequences the same way an adult would? If a child is not deemed mentally understanding and responsible like an adult, then is someone else responsible for the child? Do we take the parents eye? Do we pay the other child compensation for the harm done? Do we pay the parent compensation on behalf of their child? What if the eye destroyer is destitute, a child, and of destitute parents....taking any one of that family's eyes in compensation seems likely to create more problems and not deter crime...because what have they got left to lose? Steal, maim, murder etc because the gap between getting things they need and getting death is too narrow. They are either dying by starvation, execution or septic infection from destroyed eyes, cut off noses, hands, feet etc. At this point do you become cross and say "well clearly we need a different law pertaining to children!" Which is also why, in practice, legal systems start having laws that account for mitigating and unwieldy circumstances such as : is the individual mentally incompetent? Does being impaired by illness and/or drugs render an individual incompetent? Does it create a prickly, distasteful, murky mitigation ? Very significantly, does capital punishment and execution raise thorny (and expensive) issues of investigation and prosecution that outweigh the thorny and expensive issues of incarceration? What happens when someone is wrongly convicted and executed? What if it is later PROVEN the executed was in fact INNOCENT? Do we take the investigators eyes? Prosecutors eyes? Judges eyes? Juries eyes? Hammurabi's "eye for an eye" makes for excellent rhetoric and poor implementation. In fact, in the ancient world there is some question regarding how often these laws, as termed, were employed as termed...or if they were more "metaphorical". Did you take out the eye or did you create a penance like monetary penance, exclusion, loss of a right, loss of property etc. that is symbolically represented by loss of an eye. Nasty consequences and execution for infractions is quantifiably ineffective across the globe. Go to the 3rd world...prisons are hell incarnate, people are rounded up shot, maimed, family members shot and maimed etc....and still plenty of bad doings and crime going round and round. The justice system, and incarceration, are imperfect systems seeking to achieve a bell curve where the risks of a very bad thing getting off scott free, and the risk of innocents being wrongfully convicted/executed-- fall onto the fringes of our curve-- while the majority grinds away justly in the middle (as best it can). In the USA we view wrongfully convicting, imprisoning or executing a serious failing of democratic justice...and that it is worth the trouble and expense of not using Hammurabi's eye for an eye to avoid. @King Solomon: I am not sure what era you are currently in but this is 2019. If only the law stated: If you kill, you will be killed in the same manner. That sounds like justice!! Just Saying, you said you believe in an eye for an eye. I was going to to reply and remind you it is 2019. Someone called you on your rhetoric and now you change your statement. So, back to the debate. Does the death penalty reduce the murder rate? I have never seen any conclusive analysis of this. My gut says no, it does nothing as people who kill, many times are addled by drugs, fearing for their life, not in good mental state etc. Even cold blooded killers like sociopaths, are not considering the death penalty when they decide to kill someone. By contrast, if we had no death penalty, would we see murder rates sky rocket? I doubt it. I have lived in urban areas and usually, the murderers were killing other violent people. In other words, bad guy killing bad guy. Occasionally,a bystander gets killed but the bad guys missed their target and they are not thinking about the consequences. Usually, these guys have nothing to loose as they know they will die young anyway so one could theorize that the death penalty would increase murder rates as a bad guy might just kill a few more for good measure. There is of course the cost saving issue about killing a murderer versus housing them for life. That is a debate worth having. The death penalty is a terminal judgement so there must be an appeal process and it is possible that that legal process costs more than housing the murder. At the end of the day, I consider the following. Are we any better if we "kill" a murderer? We would be doing this while of sane mind and not impaired by drugs or alcohol? Is there any species on this planet that does this besides humans? I direct you to one of the last scenes in Planet of the The Apes for your answer. How do you ask a person to essentially kill in cold blood when they are not in a war zone or hostile territory?? Instead, I say let them sit in jail, isolated from society and the world, and spend a long time living with what they did. Killing them just lets them escape a life an anguish. Maybe have special life sentence jails with no TVs, poor tasting food, etc. Just don't equate justice for killing with killing again. First of all I'd like to say how sorry I am to the Douglass family for their tragic loss! Maybe it's true that criminals don't stop and think of what will happen to them if they get caught, but that still doesn't mean we shouldn't make the punishments fit the crimes. Too many times we have seen that people get their hands "slapped" for committing crimes -- short jail time if any at all -- only to see the same people getting arrested again and again for the same types of crimes. I for one am in favor of the death penalty when someone commits murder. It will never bring the victim back, but it will prevent the murderer from killing again. the death penalty only delays justice for the family. They sit on dealth row for years, not giving any closer or allowing the victims family to move on. I say give life with no prole. Let the families heal. "Does death penalty reduce crime rate?